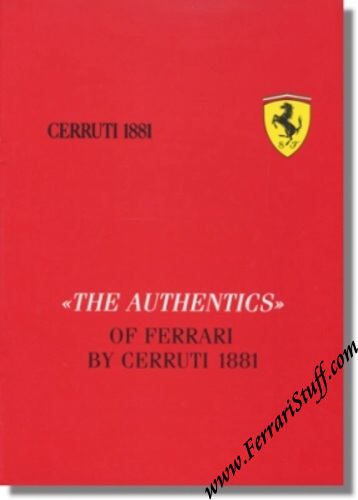 The Authentics of Ferrari by Cerruti 1881 Brochure. 13 page color catalog, 8.25 x 11.75 inches. Red cover with Ferrari shield logo and Cerruti 1881 logo. Elaborates on the origin of Cerruti Ferrari clothing with picture of Jean Todt & Nino Cerruti, shows product images and lists all available items.